Maryland President: "I Would Think" UNC Will Get The "Death Penalty"
While the NCAA and UNC have spent the past three years shifting the blame for the university’s fake-class scandal between academics and athletics, public speculation from academia and college athletics officials has been scarce. 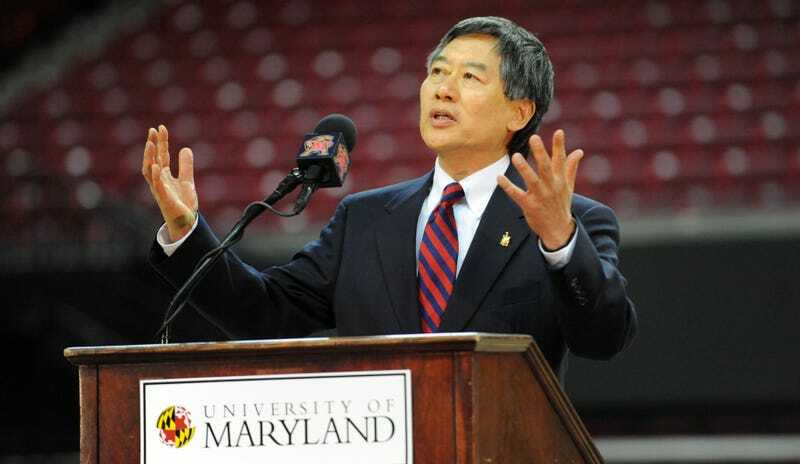 Monday night, Maryland president Wallace Loh became the most prominent administrator to enter the fray. The News & Observer obtained an audio file of the university’s latest monthly senate meeting in which Loh can be heard saying that he believes the outcome of the dragged-out NCAA investigative process—coming up on year three in June!—will be “the death penalty.” The comments were made in response to a question asked of Loh by a faculty member as to whether the university will be “protected from the corrupting influence of athletics.” Typically, summaries of the senate meetings are posted on the group’s website; the latest meeting’s minutes have not been added as of April 11. The “death penalty” is the rarely used NCAA punishment of banning a program from competing for a full season—the last case of the NCAA implementing said measure in Division I sports came in 1987 following the uncovering of SMU football team’s pay-for-play setup. More recently, the men’s soccer program at Morehouse College, a Division II school, and men’s tennis program at MacMurray College, a Division III school, were issued multi-year death penalties. Neither program has resumed competing in the NCAA. If you forgot, because it was half a year ago, UNC told the NCAA in its second response to Notice of Allegations in August that the athletics-focused governing body lacked jurisdiction to take on this case, claiming it’s an academic issue and not an athletics-specific one. The NCAA countered in September in its response to the response (it’s really a convoluted, bureaucratic shitshow), arguing that it is not interested in criticizing UNC’s academic departments “even if managed poorly,” just the situations tied to athletics. The NCAA issued a third Notice of Allegations in December, which UNC was supposed to respond to by March. Instead, the NCAA granted them an extension, ensuring that the case will continue to not follow any sort of NCAA-structured timeline and likely drag on into 2018.